A new variant of Creutzfeldt-Jakob disease was described in the United Kingdom. It is often claimed that it is caused by consumption of food infected with the agent of bovine spongiform encephalopathy. However, this remains open to question because the number of cases of the variant is, at the present time, less than would be expected from a major food-borne source. The EUROCJD cooperative study presents currently available epidemiological data of Creutzfeldt-Jakob disease and its new variant, for nine European countries plus Australia and Canada. Unexpectedly, for the United Kingdom where all but a few cases of the new variant have been reported, these cases have to be included in the incidence curve of the sporadic forms of the disease in order to obtain the best fit with the median curve from all the countries. This variant could be merely a rare clinical phenotype within the sporadic disease. The published clinical and experimental data which suggest that it is linked with bovine spongiform encephalopathy, lead us to propose that this link could be a common etiological origin other than consumption of bovine infected food. In any case, public health recommendations hold and further investigation is required. The lack of a relative increase of the Creutzfeldt-Jakob-disease mortality rate in the United Kingdom, does not fit well with the new variant being the consequence of consumption of food infected with the agent of bovine spongiform encephalopthy. A new variant (nvCJD) of Creutzfeldt-Jakob disease (CJD) involving ten initial cases , was clinically described in the United Kingdom (UK) in 1996, shortly after the epizootic of bovine spongiform encephalopathy (BSE) in the UK. The isoform of the prion protein from this new variant has physicochemical properties, distinct from other strains of CJD, that resemble what is found in BSE . The results of experimental transmission to mice are consistent with the BSE prion being the source of this new disease . Altogether, these results led many people to claim that BSE caused variant CJD , assuming that nvCJD is caused by consumption of BSE-infected food. However, it appears that this link between the BSE prion and the nvCJD remains open to question [5–7]. The shape of the epizoic curve of BSE in the UK  suggests a major food-borne infection and it is presumed that the general British population has been exposed to the BSE prion. However, the nvCJD is to date a rare disease that is predominantly found in young people. The current shape of the epidemic curves has suggested that nvCJD is not caused by consumption of BSE infected food . However, human exposure to BSE could depend on a range of unknown variables, so that extrapolation from conventional food-borne epidemics to nvCJD could appear to be somewhat simplistic . A so-called back-calculation analysis (assuming a mean incubation period well beyond the human life-span) showed that these curves are compatible with this hypothetic food-borne infection . The aim of this paper is to continue the debate on this issue as has been suggested , in the hope of stimulating new ideas that could fit the whole of the epidemiological, clinical and experimental data that are now available. The EUROCJD project started in 1993 http://www.eurocjd.ed.ac.uk/sporadic.htm, and compares data from national registries in Australia, Austria, Canada, France http://www.invs.sante.fr/publications/mcj/donnees_mcj.html, Germany, Italy, the Netherlands, Slovakia, Spain, Switzerland, and the UK http://www.cjd.ed.ac.uk/figures.htm. We perform here an exhaustive analysis of the data now available online from this project. By no means did the nvCJD cases lead to an increased mortality rate from CJD in the UK as compared with the other listed countries. The hypothesis that the emergence of the nvCJD is the consequence of eating BSE-infected meat does not fit well with the data from the countries covered by the project. However, the two illnesses could have a common etiological origin. Since 1995, apart from six cases in France http://www.invs.sante.fr/publications/mcj/donnees_mcj.html, one in Ireland, one still alive in Italy , one in the USA , one in Canada http://www.eurocjd.ed.ac.uk/vCJD.htm, and one in Hong Kong, the new variant of CJD has been reported only in the UK. It could be expected that, together with the familiar sporadic CJD, the resultant epidemiological data would show a significant increase in the UK as compared with the other countries included in the EUROCJD cooperative study. However (Table [see Additional file 1: Table.xls]), taking into account the respective population sizes, the number of cases in the UK (nvCJD included), does not differ from that in the other countries. For Canada, only cases classified as "definite" were listed and the study was retrospective through 1997, so that the values were lowered (since 1998, the mortality rate is 0.73 to 1.04 and fits what is found in the other countries studied); for Slovakia, the number of cases is too low for a comparison to be done (1 to 3 cases for a mortality rate of 0.20 to 0.60). In order to focus on the countries that were comparatively studied since 1993, only the data of the nine other countries included in the EUROCJD project are presented in the table [see Additional file: Table.xls] and in the figure. As can be seen in the figure, the curve corresponding to UK CJD-plus-nvCJD cases tightly fits the median curve from the nine countries taken together. 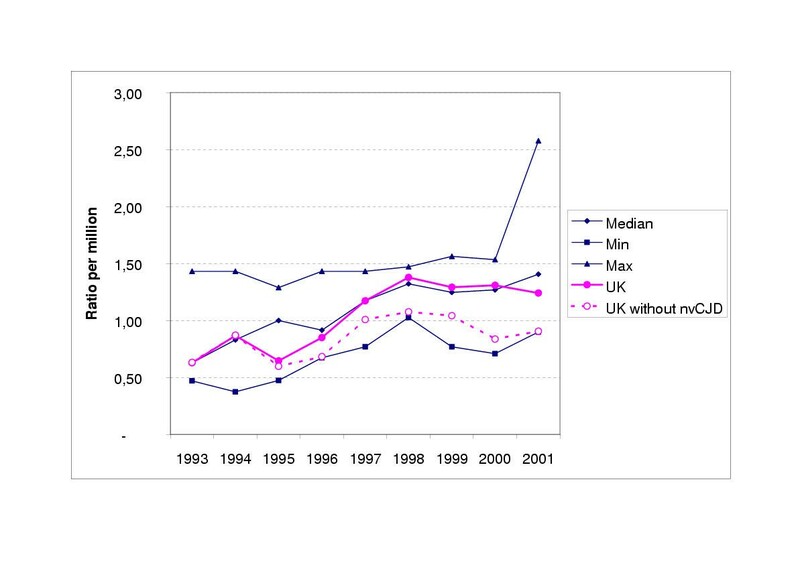 If only sporadic CJD is taken into account (broken line), the UK data are visibly lower in that they have remained stable since 1996 in contrast to the other countries where the values tend to increase. This increase accounts for the rate of growth of the median curve, which is consistent with the view that improved ascertainment of previously misdiagnosed diseases has occurred (but actual increases of some values cannot be excluded). Differences in ascertainment are possible between different countries, but, as a whole, the curves are concordant. An exhaustive examination of the data shows that, for some countries, the incidence of CJD can abruptly increase about two-fold or decrease roughly by a factor of two. But, in contrast with the UK, these modifications last only one year. For instance, the absolute number of cases of sporadic CJD in Australia was 17 in 1993, 11 in 1994, and 19 in 1995; it was also 27 in 2000 and 14 in 2001. For the Netherlands, the number of cases was 18 in 1994 and 8 in 1995; it was 19 in 1999 and 11 in 2000. In Switzerland, there were 10 cases in 2000 and 18 in 2001. Poisson distributions do not account for these discrepancies  which rather suggest a clustered distribution of some cases ; such a clustering suggests that CJD could be the sum of clinical phenotypes with possibly different local etiologies (see below). Currently, we are not aware of a clustering in the UK over the past ten years. In any case, this pattern is difficult to prove for such a rare disease. We have done an additional analysis of the countries in the NEUROCJD system (Belgium, Denmark, Finland, Greece, Iceland, Ireland, Israel, Norway, Portugal and Sweden), concerning definite and probable cases (deaths) of sporadic CJD http://www.eurocjd.ed.ac.uk/sporadicneuro.htm. This comparative study began in 1997. If all the values are taken into account (Iceland excluded, with only one case in 1997 for a population of 272000), the annual median values are successively 1.02, 0.58, 0.66, 0.81 and 1.24 from 1997 to 2001. It is more appropriate to focus on the four countries that have a population greater than Switzerland and a number of cases that permits to obtain reliable annual mortality rates: Belgium, Greece, Portugal and Sweden. The median is then successively 0.8, 0.9, 0.97, 1.16 and 1.27. These increasing values suggest an improved ascertainment of previously misdiagnosed diseases as seemed to be the case for the countries included in the EUROCJD project, from 1993 to 1997. For the NEUROCJD system, the value obtained in 2001 fits what is now obtained in the EUROCJD project, so that the same situation seems to exist in the whole Europe. Hence, currently available epidemiological data show that nvCJD accounts for no relative increase of the CJD mortality rate in the UK, which does not fit well with the idea that nvCJD is the consequence of consumption of BSE-infected food. The clinical and experimental peculiarities of nvCJD can give the impression that nvCJD is merely a clinical phenotype within CJD. One can imagine that CJD cases are the sum of clinical phenotypes the etiologies of which can differ from one case to another; the relative proportions of these phenotypes can also fluctuate with time. Some of these variants could have been previously misdiagnosed , or could be indeed a new disease  (the only two cases of nvCJD in the USA and Canada have both lived in the UK, which argues in favour of the latter hypothesis http://www.who.int/mediacentre/factsheets/fs180/en/). The sum of all the cases could be rather constant, perhaps with some fluctuations that could only be ascertained by a long range and exhaustive study. In order to account for the clinical and experimental data which suggest a link between nvCJD and BSE, one could hypothesize a common factor that has been operating independently for BSE and nvCJD. For instance (and among additional possible etiologies), one can imagine that a rare subtype of food-borne-sheep-derived scrapie agent that could have been the source of the epidemic of BSE in the UK , could have been independently the source of nvCJD for a few human beings, depending upon unknown and stringent variables. If it is true that CJD in due to diverse etiologies, this could explain, for instance, that a country as Australia which is not known to have scrapie and is at very low risk of BSE, has a mortality rate for sporadic CJD comparable to the other countries. Actually, a food-borne transmission of scrapie to man has never been proven on epidemiological grounds. If this was possible, discovering the BSE prion subtype in a scrapie sheep would not necessarily imply a contamination of the sheep by BSE. We are not aware that largescale ongoing studies have led to discover such a subtype at the present time. In any case, this debate is still open and other scenarios are possible indeed. From the current data it is not possible to infer what will happen in the years to come. The epidemic curve of nvCJD could eventually take a shape suggesting a food-borne infection possibly caused by BSE-contaminated food. Alternatively, the numbers of cases of nvCJD in the UK, that peaked in 2000 (15 deaths in 1999, 28 in 2000, 20 in 2001, 17 in 2002), could continue to decrease. A recent study suggests that it is actually the case . The delay of 8 years that separates the major epidemiological curve of BSE (that peaked in 1992) and the minor curve of nvCJD is usually taken as demonstrating that BSE has caused nvCJD. One could also hypothesize that a major contamination of the bovines in the UK due to waves of recycling infected cattle waste in meat and bonemeal, has shorten the incubation for BSE. Concerning prion diseases, public health recommendations hold, but if public safety is rightly the prime consideration, the debate has to remain open in order to elucidate the real cause(s) of these diseases. We have to be concerned that a speculation could eventually be accepted as a demonstrated fact and thus close an important debate which still possibly requires further investigation for a long time. A new variant of CJD was clinically distinguished from CJD shortly after the epidemic of BSE in the UK. With the help of biochemical and experimental data, this led many people to claim that this variant was caused by consumption of BSE-infected food. However, nvCJD accounts for no relative increase of the CJD mortality rate in the UK, so that nvCJD could be merely a subtype of CJD. We hypothesize that CJD could be a set of clinical phenotypes and that the new variant could be one of these phenotypes sharing its etiology with BSE, without being caused by consumption of BSE-infected food. In any case, no definite conclusion can be made at the present time and this issue deserves further investigation. The authors jointly conceived of the idea for this study. A H hypothesized from the epidemic curves, that nvCJD is merely a clinical phenotype within the sporadic disease. This idea was completed by I L, namely that BSE and nvCJD could have a common etiological origin.